It’s been a bit of a tumultuous history for Marvel Heroes, beginning with an “oops” of a launch, a massive overhaul of tanking in the game along with major changes to every single hero over the past five months. Now, Update 2.0 brings with it a brand new hero, Loki, along with new event leaderboards, UI and sound changes, item changes, quite a few new and modified powers, and a brand new chapter of content. Welcome to Update 2.0, Asgard! Asgard – Game Update 2.0 is now live in Marvel Heroes! Our biggest content update ever features a new playable character… the God of Mischief himself, Loki! Unlock the Bifrost Bridge to Asgard, adventure through expansive new zones, play through new story missions, explore our new player hub, and much more! Below are some highlights but be sure to check out the full patch notes for Asgard – Game Update 2.0 here! Looking to track your progress in the Asgard Unlock Event? Head over to our Asgard Event Leaderboards! Loki has been added to Marvel Heroes! Loki is the Norse god of mischief and evil and the adopted son of Odin All-Father, the ruler of Asgard. He is crafty, clever, and resourceful, using sorcery to achieve his intricate goals. Loki resents the glory and acclaim given to his adoptive brother, Thor, and he strives to place himself on the throne of Asgard. However, on the rare occasions when his goals overlap with Thor or other heroes, Loki has been to ally himself with those he would otherwise detest. Sticking with the Asgardian theme, check out Storm decked out in her Asgardian Armor as well as the first Enhanced Costume for Thor – Beta Ray Bill! The epic story of Marvel Heroes continues in Asgard with brand new story missions featuring fully-voiced motion comics! New item types like rings and Legendary items each have their own new item slots. Players will want to hang on to legendary items, as they grow stronger and gain experience along with the player! Marvel Heroes now has a brand new roster of starting heroes for new players to choose from. Expanding from the previous five choices, players can now pick a free Marvel superhero from a list of nine exciting and unique playable heroes. Pack your suits and bait your lines: the season of high-summer adventures returns to Telara on July 25! With the worst of the Architects’ threats yet to be revealed, you can rest and relax – or romp through scavenger hunts, battle the forces of Swarmlord Karhgroth, fish, explore, and catch rare companions – all under a balmy summer sky. In tune with the cyclical nature of the seasons, Swarmlord Khargroth gathers those loyal to him and unleashes them upon Telara. Thwart his quest for revenge and loot the treasures of the devilish Fae. 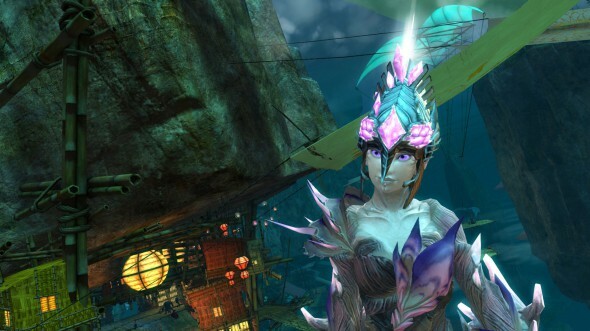 Join your friends for scavenger hunts throughout Telara – ride a barrel down Scarlet Gorge Falls, risk life and lips to plant a kiss on some of Telara’s greatest villains, and more. You’ll have to follow the clues, though – hunt objectives aren’t marked on your map! 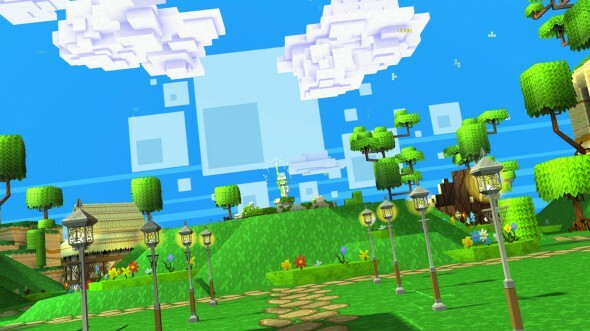 Unique and adorable critters return to zones across the continent of Mathosia. Catch and befriend up to 11 special companions, from black bunnies to striped prairie dogs and colorful cobras. Summer fashion’s alive at the RIFT Store! Sport a variety of swimsuits and exclusive items including Sunset, a feisty avian companion. Camp out to earn the title “the Counselor” and catch Summer Sunfish from special nodes throughout the event. As you complete Summerfest quests, you’ll earn Friendship Bracelets and Merit Badges you can trade in for seasonal loot. During Summerfest, Daily Login Gifts have a chance of including 25-75 RIFT Credits. If you’re a Patron, you have an even higher chance of receiving free Credits! 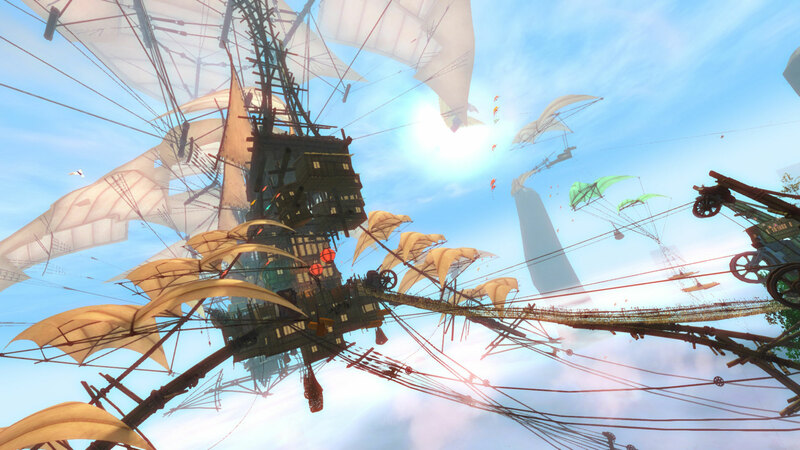 In an ArenaNet article today, Colin Johanson outlines the GW2 roadmap for the remainder of 2013. The best part? All your endgame gear won’t become useless with new content as they’ve decided to launch new skills and traits instead of gear progression. Also, crafting is also getting a boost to 500 and given access to a brand new tier of materials. But the most shocking development? Magic Find goes boom. It’s being removed from gear and being applied account-wide to all characters you own based on account completion unlocks. I really hope it’s still possible to get the massive +MF stats the top “loot hunters” are used to having without a massive amount of time spent. I like having one class I can use to farm mats and gold drops. I don’t want to spend dozens (hundreds?) of hours completing account unlocks just to return to a shade of my former glory. 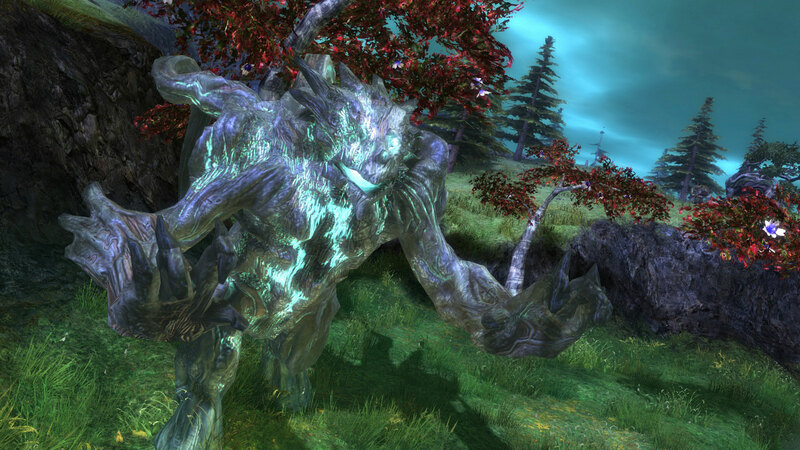 In January, we talked about where we wanted Guild Wars 2 to go in 2013. We’re a little over halfway through the year, and we felt it was time to give you an update on where we stand, where we’re going, and discuss in more detail some of the systems you’ll see in the second half of 2013. At the start of the year, we talked about the Living World in Guild Wars 2 as a new initiative; a plan that we wanted to expand and grow, learn from, and make more frequent and larger in scale as the year progressed. We’ve learned a lot so far this year, resulting in our recent announcement of our new cadence of bi-weekly major releases for Guild Wars 2 and our goals for the future of Tyria as a living world. We’ve also transitioned from our original single Living World team, which operated with very short turn-around time for most of the first half of the year, to four Living World teams for the second half of the year. This will allow our teams a much greater amount of time to both develop and polish the content that drives the theme of each of our releases. Our Living World releases will expand on the promise of what it means to be a continually growing game. In the future, you’ll see a wider array of content and experiences in each release, with a greater focus on permanently expanding content. We’ll go into specifics on the variety of playable content you’ll be receiving as each update approaches, but some of our focuses will include improving our existing world bosses, continuing to update and refine our dungeons and fractals, creating world events with a larger and more permanent impact, and expanding the number of dynamic events across the world. 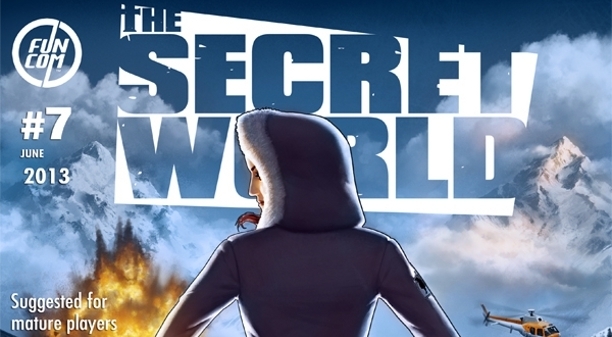 On top of all of this, look for the return of some of your favorite holiday festivals and super adventures mixed in among our Living World updates, though the focus for the second half of the year will be on a mix of permanent and more impactful content. So outside of new playable content in the world to experience, what else will you be seeing? One of the core points we addressed back in January but didn’t provide specifics on yet related to progression. We’ve seen a lot of questions in regards to this after the release of ascended gear: What will the core reward system be for Guild Wars 2 in the future after ascended gear has all been released? We specifically said we don’t want to get caught up in the trap where every 3-6 months the game adds another tier of gear to the game; that invalidates all your hard work and the rewards you’ve earned. So what are we going to do instead? We’ll begin regularly adding new skills and traits to the game for each profession to expand your characters and builds! You will be able to earn these new traits and skills by unlocking them. To go along with this, we’ll expand the content and options to earn skill points to help encourage players to experience different challenges and content throughout the world. These skills and traits will be designed to be balanced with the existing skills/traits we currently have in the game, and will simply compliment and expand the range of abilities and tactics available to each profession. Both WvW and PvE players can acquire skills and traits, and additional means of earning skill points will be addressed for both core content areas. The regular addition of skills and traits that you can earn as you play provides us an extremely stable, easily expandable reward system that fits neatly into the pillars of progression and advancement that Guild Wars 2 are all about. Your character will be able to grow and change for years to come without invalidating everything you’ve earned so far. One of the main areas of focus for our blog at the start of the year was rewards. We’ve already rolled out some of the core systems we discussed back then: rewards for daily/monthly achievements, the ability to choose between achievements, the account achievement reward system, the guild mission reward system, mega-event reward chests, expanded ascended gear/infusions, and progression rewards in WvW. Champions in the game will be updated so each will always drop a guaranteed reward box for any player that qualifies for a reward from the boss. This chest will contain things like crafting materials, skill points, unique skins, lodestones, and more. This change will make champions more rewarding, and will make playing in Orr and Southsun Cove (where events can scale up to add champions) more exciting and fruitful for guilds and players joining together in the open world. In order to make playing all of our unique dungeons more rewarding, we’ll give you a bonus gold reward for each dungeon path you complete each day. Coins will be removed from the current bosses (replaced by the champion reward box listed above) to coincide with this bonus payout for completing each path. Completion rewards will be guaranteed, and we’ll vary the amount of gold earned based on difficulty and length of each dungeon path. To encourage players to participate in a wider array of dungeon content, we’ve designed the system so if you complete the same dungeon path twice in one day, you’ll receive the normal reward for completion, but won’t receive the bonus gold reward again during that day. We’ll also add a new set of account-bound crafting materials to the game. You’ll receive these materials as guaranteed rewards once per day per unique location for completing content within a category of gameplay in Guild Wars 2. For example, capturing camps, towers, and keeps in WvW will earn you these crafting materials. In the Living World, you can earn them for killing giant world bosses, defeating dungeons, completing jumping puzzles, completing mini-dungeons, finishing some types of guild missions, capturing temples in Orr, and other activities. Mix it up and try your favorite mini-dungeons one day, your favorite jumping puzzles the next day, and on an another day capture supply camps in WvW instead to earn the crafting material. Or if you want to do all three in one day, the choice is yours! Players can earn each of these guaranteed reward crafting materials from a variety of content across both PvE and WvW to give players choice in what type of content they enjoy. We want to remove the choice players are currently being forced to make on their gear: “Do I go with better stats, or better loot?” This isn’t in the spirit of cooperation that Guild Wars 2 is all about. As such, we’ll be removing magic find entirely as an item stat and turning it into account stat that improved the odds of rare drops for all your characters. You can improve your account magic find through the account achievement reward system and from consumable items found in game. As your magic find increases, it will require more consumables to keep raising it higher. In the near future, we’ll detail the system we’ll use to replace the existing magic find items. Our goal will be to have as little disruption as possible to those who currently own items with a magic find stat on them. We’ll expand all crafting professions to allow them to reach a new milestone: 500 points! At 500, crafters will be able to craft ascended weapons and armor. Once you reach 500, a new tier of crafting materials will be available to you; this new tier of materials will be made by combining lower tier materials. This tier is time-constrained, so each item can only be made once per day in order to help give high-level crafters their own economy of items to build and sell that retain their value and rarity. This new tier of crafting material, along with the new guaranteed material rewards mentioned earlier and some other materials we’ll introduce will be used to craft ascended weapons, armor, and more. These weapons and armor will also be able to be found as rare drops from locations in the world. Ascended weapons and armor will remain account-bound like other ascended gear. We aren’t quite ready to go into all the details here, but what I can say is you will see a specific way to build precursor items on your way to a legendary. On top of this, you’ll also see new legendary weapons and new types of legendary gear in 2013. Building your precursor will require a large amount of the new crafting material rewards listed above, 500 in crafting, and likely a combination of other items earned for completing more specific content in the game. In addition, we’ll also improve the functionality of legendaries, allowing you to set their stats when out of combat to any stat combo available, so you don’t need to transmute stat changes for legendaries. Legendary gear will remain with the same tier of stats as ascended gear and will not be made more powerful than other gear, it will simply be slightly more convenient since it will no longer need transmutations to change stats. What About World vs. World? 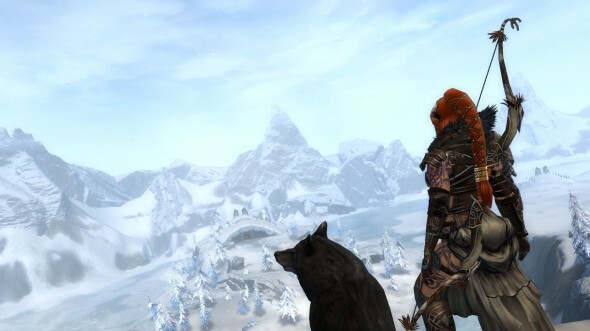 So far this year WvW has seen some major updates: from the removal of culling to the new progression, reward and ability system, our WvW population has been rapidly on the rise since January. 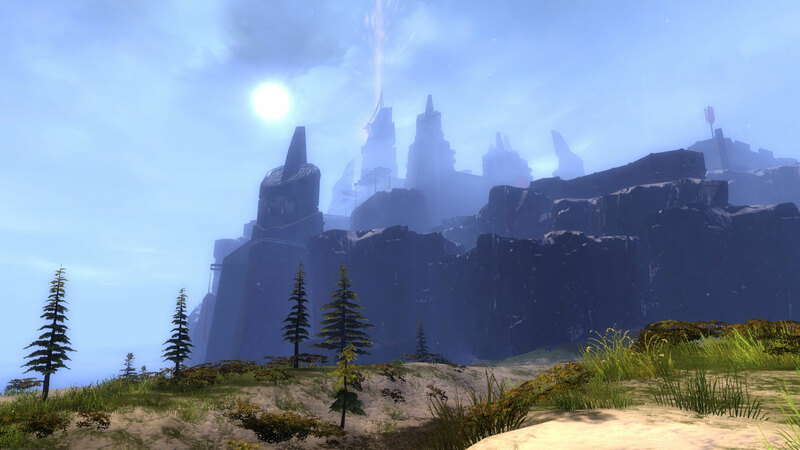 Our WvW team coordinator Devon Carver did a fantastic job summarizing where we want to take WvW in the future in his blog here. 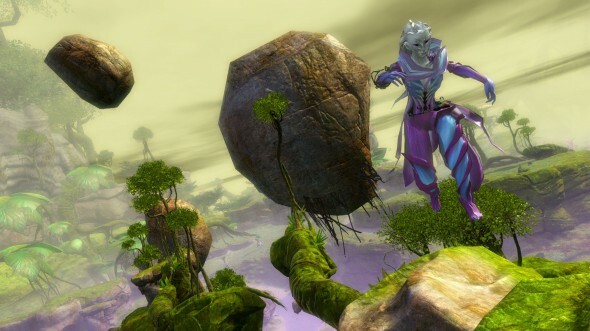 One additional exciting release you’ll see on top of the high-level notes Devon called out in his blog post is the replacement for the original WvW orb mechanic in our borderlands maps. This change should provide more diversity in the gameplay of WvW and make our borderlands more exciting. Of course, everything I’ve talked about in terms of progression and rewards in this post so far will be available in WvW as well! Wow This Got Long—What About PvP? 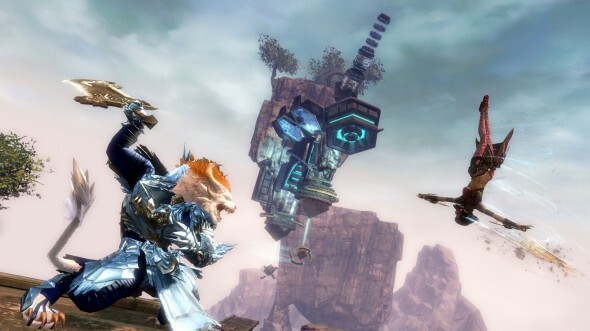 The addition of custom arenas, rated play, leaderboards, and spectator mode have already been big steps for Guild Wars 2 PvP in 2013. Going forward, we’ll continue to work with and support the rapidly growing competitive PvP community with our eyes towards an extremely exciting future as we work towards solidifying the base. We know we have a lot of work to do to continue that momentum and ensure our PvP experience is everything we ever wanted it to be, so what are some of the things we have coming to get there? The major focus of the PvP team for the second half of the year will be tied to improving the sense of reward in PvP. In the spirit of the high-level strategy listed above for PvE/WvW rewards that ensure players feel rewarded for their time, we’ll need to build systems that achieve the same goals in PvP. Our PvP team will go into more details on these systems once they are further along. The addition of new skills and traits on a regular basis will of course mean expanded variety of abilities, builds, and tactics in PvP as well. As these additional skills and traits are added, they’ll be automatically unlocked and available for competitive PvP just like all existing skills/traits work today. We’ll also expand the competitive options for game play: providing a queue and leaderboards for solo rated play separate from team rated play, adding new map types, adding the ability to gain legendary weapon skins in PvP, providing additional rewards and growth to our major competitive PvP tournaments, hosting our own Year One PvP Championship at PAX, and more! What Else is the Game Doing to Grow? At well over 3 million copies sold in the US, Europe and Australia combined, Guild Wars 2 has had an amazing first year, but we have a long ways still to grow. 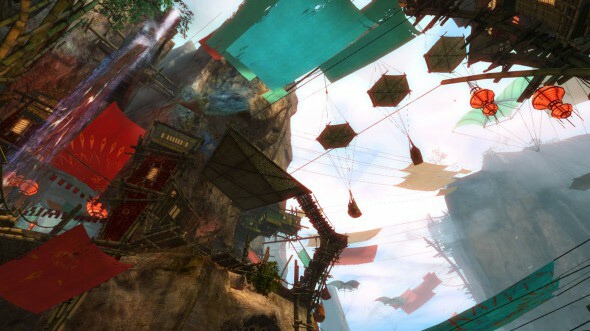 Many of the core regions for online gaming are on deck to join the Guild Wars 2 community in the years ahead and grow our base to new heights. We’ve already done our first limited beta test in China, with future tests planned to help prepare the game for release with our incredible partner there, Kong Zhong. To prepare the game for its eastern release, we’re building a new comprehensive “level zero” optional tutorial that teaches the core basics of the game. We’re also adding new story steps at levels 5 and 10 to help better teach core mechanics as players grow. We will also be adding a much better hints system, and a new level-up messaging system all to better teach the game. All of these systems will be added to the game not just in the east, but to help future new players in the west as well. From the upcoming release of our brand spanking new Looking for Group (LFG) tool, to investigating ways to limit culling in PvE, to the two-week content schedule our Living World teams have in store, the second half of 2013 has countless more exciting new things in store for our players than I can possibly cover here. As always, the content above is subject to change as we test and iterate on these systems. 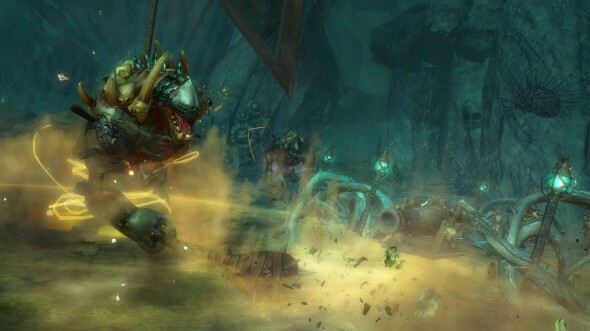 We hope you’re excited as we are about where Guild Wars 2 is going in the second half of 2013. The world of Tyria is in for one hell of a ride in the months ahead and we hope you join us to experience it—you’re not going to want to miss it! The folks over at ArenaNet have put together a “spoiler-free” guide to their new content, including several tips for each of the content locations! Definitely worth a look as this just launched. You can check out the original article over here. Welcome to our newest release, the Bazaar of the Four Winds! You may be wondering what there is to do and how to get around, so what follows is a short guide to point you in the right direction. 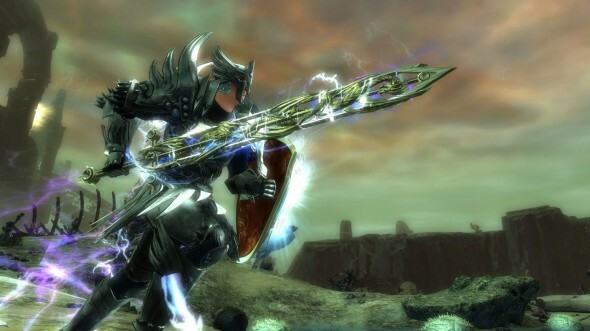 When you log in to Guild Wars 2, you’ll receive a mail detailing the current situation. Be sure to press the “Show me” button at the bottom of the mail to get pointed in the right direction. 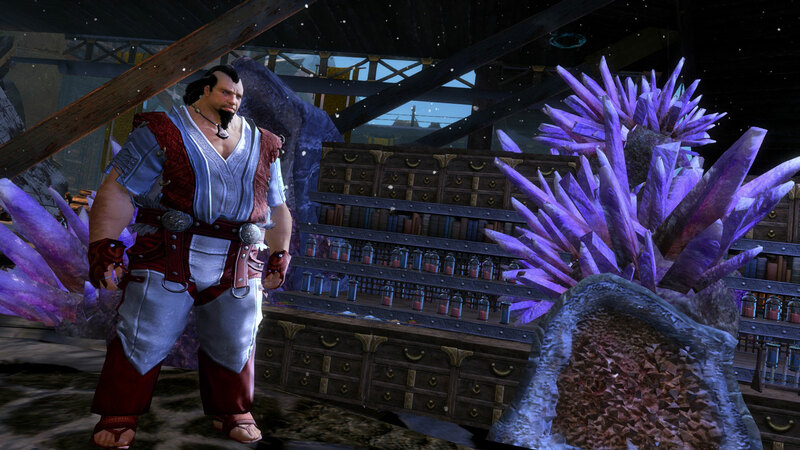 To get to the Bazaar, head to Lion’s Arch and look for the Labyrinthine Cliffs Transport Facilitator. He is marked on the map with a gold star and is in the same spot that was used to boat players over to Southsun Cove before the asura portal was finished. Once you arrive in the Labyrinthine Cliffs, you can travel through the Bazaar up to the cliff peaks to reach the Zephyr Sanctum. However, you will need to utilize the three Aspect skills that are available in the map to make it to the top. You can acquire these skills by collecting the Aspect Crystals located next to Sun, Wind, or Lightning Adepts or sprinkled throughout the map. The citizens of the Zephyr Sanctum (“Zephyrites,” as they call themselves) have developed a unique understanding of wind, lightning, and the sun. They have learned how to utilize these Aspects in their daily lives. By imbuing crystals with the energy of the Aspects, the Zephyrites are able to share a taste of this knowledge with others. In order to ease the paths of weary travelers, the Zephyrites have scattered these Aspect Crystals throughout the Labyrinthine Cliffs while they are docked to trade goods at the Bazaar of the Four Winds. Walking over an Aspect Crystal will grant you 10 charges of a movement skill associate with that aspect. Wind Crystals have a blue glow and allow you to leap to new heights! Sun Crystals glow orange and grant bursts of speed. Lightning Crystals are purple and allow you to launch yourself across wide gaps and leap with precision. Using the Sun and Wind Aspect skills together allows you to perform a leaping dash. Players who master this technique will discover many shortcuts and beautiful views along the cliffside. When you gain the Aspect of Lightning, the skill is ground targetable. However, as you traverse the cliffs, you may notice purple tether points along the way. Using the Lightning skill near these will automatically launch you to a matching tether point with no additional targeting required. The Zephyrites have thoughtfully painted symbols on the rocks and walkways to provide hints regarding what Aspect must be used to overcome nearby obstacles. What can I do at the bazaar? The Zephyrites have scattered Sky Crystals amongst the rocky nooks and crannies of the Labyrinthine Cliffs. Players can utilize the three Aspect skills to reach these locations and prove that they are as nimble as any Zephyrite. The Zephyrites have placed over 50 Sky Crystals in the area, but you need to find only 40 to earn your reward. If you have not activated a Sky Crystal, its name will be visible if you press your Control key. Once you have activated one, the name will no longer be visible. Use this to quickly scan an area for new crystals or to remember if you have gotten a crystal before. Players can earn a model of the Zephyr Sanctum by completing the Lessons from the Sky achievement. When you double-click the item in your inventory, the model will appear. You can then interact with it to view a cinematic of the Zephyr Sanctum. Please note that you can only use this item in cities. Sanctum Sprint, a new racing activity that takes place in the crags and crevices near the Labyrinthine Cliffs, is now available. This activity will only be available for this release, but may return in the future. Players must use the three Aspect skills to complete the course and reach the top. There are also offensive and defensive boosts to be found and used against your opponents. To enter the activity, you must talk to the Aspect Master, who is standing near the entrance to Zephyr Sanctum at the top of the Labyrinthine cliffs. In the Sanctum Sprint, your Aspect movement skills can be empowered by running over Aspect Crystals. You will often need the powered-up version to access the quickest route through the track. Scattered about the track are blue crystals that boost endurance as well as red crystals that grant swiftness and vigor. Don’t be discouraged if you don’t finish first. Everyone who crosses the finish line before the time limit will earn a chance to win a tradable Aspect Back Item from the chest that appears! Stop by the tavern on your way to the top of the Bazaar and you’ll meet Poyaqui, leader of the mysterious Order of Om – a group of competitive drinkers whose drink of choice is Omnomberry juice. Any chef worth their salt knows that cooking Omnomberries removes the vile taste as well as nearly all harmful effects, but these drinkers actually chill the stuff so they can find out who can drink the most in a new permanent activity called Belcher’s Bluff. In order to challenge Poyaqui to a game of Belcher’s Bluff, you must first defeat the 5 other members of the Order of Om. Poyaqui will send you a mail detailing their exact locations if you attempt to challenge him. The nearby Bartender also sells Belcher’s Bluff kits, which allow you to challenge other players to drinking matches. In fact, all bartenders in Tyria should now offer these kits to interested parties. Each member of the Order of Om uses a unique signature skill that they have developed. By defeating them, you can learn these extra skills, which may give you just the edge you need against Poyaqui or other players. Icons will also appear above the heads of players indicating what action they took. Also pay attention to your opponent’s health bar – whether it rises, falls or stays the same should indicate which skills they are using, allowing you to predict what they are going to do next. 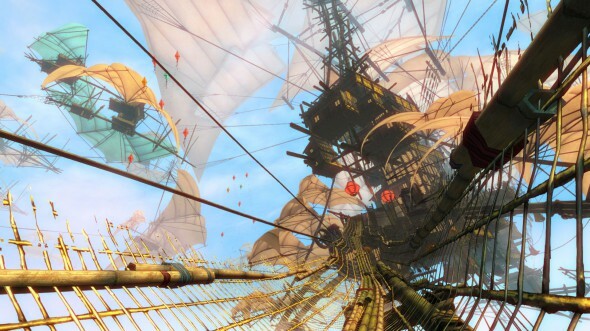 Merchants have trekked many miles to bring bulk orders of cooking ingredients from all over Tyria to the bazaar. It’s a one-stop cooking shop! The Zephyrites are looking to stock up on supplies that can’t be found while flying around in their Sanctum. You can find them near the repair merchant on your map. They are willing to take various resources (such as ore, wood, candy and more) in trade for Zephyr Sanctum supply boxes. These supply boxes contain new items including recipes for weapons and armor with a new stat combination. Also located by the repair merchant is a Fortune Scrap Vendor, who will trade Fortune Scraps for unique Zephyrite items, including Zephyrite Aspect Helms and Zephyrite Aspect Backpacks. Fortune Scraps can be found in Kite Fortunes, which will drop off all creatures in the game. Each Kite Fortune yields at least one fortune scrap and also provides a 10 minute random buff that stacks duration. Kite Fortunes are also being sold in bulk through the Black Lion Trading Company. What can I do in the open world? The Zephyrites are launching numerous kite baskets, and they are landing nearly everywhere in Tyria! Find these kite baskets in all explorable areas (except for Orr) for a chance at quartz (a new resource used for crafting), new armor and weapon recipes and kite fortunes. Each kite basket will yield two supply bags that everyone can interact with. However you will only be able to grab supplies from a specific location once per day. Plan a route through Tyria to make the most of your basket hunt! You can also find Quartz nodes in the Labyrinthine cliffs, and completing the Meta achievement will allow you to receive a personal quartz node in your home instance, so you will never run dry, even after the Sanctum departs. Thieving skritt have pilfered a handful of Kite Baskets from the Sanctum. Players can locate these at the top of several jumping puzzles throughout Tyria and open them for extra rewards. I received an email recently (contents below) reminding folks that the Firefall open beta is coming up on July 9. Firefall’s been in what’s seemed like an open beta for 18 months as thousands and thousands of players have had access during closed beta weekends because they pre-purchased a Founders Pack. If you haven’t yet hopped on the hype express for Firefall, take a look and download the game so you’re ready for open beta next week. Less Than Two Weeks Until Open Beta! Firefall is a little over a week away from open beta, and we couldn’t be more excited to show all of you what is on the horizon. Our latest content patch goes live today for our current testers, giving them an early taste of new missions, the new Jetball PvP game type, and brand new areas to explore, including our newest instance, Blackwater Anomaly. As we approach Open Beta, time is quickly running out for you to purchase a Founders Pack! These packs not only allow you access to the game before the general public, but each tier comes with exclusive items like special edition tiki masks, warpaints, a thumper, and a unique vehicle that will never be available again once the Founders program ends. Be sure to visit our Founders Pack page to see what each tier offers, and pick up the one that is right to you. We recently posted a short teaser of a super-secret Firefall project on our Stage 5 TV YouTube channel. What could it be? Watch the teaser to find out, and then see the full video on July 9th! The latest Marvel Heroes patch addresses 11 different boss updates along with crafting and quite a few miscellaneous updates. Click here to see the official article. The previous ‘Special Mission Reward’ box has been transformed into… a Mystery Egg. Players affected by the ‘unlock only’ bug (from around launch) will find an item called ‘Mystery Egg’ in their inventory if they had an unused hero token that was ‘unlock only’ (the bugged token). This item will ‘hatch’ into a new Starter Hero unlock in a near-future patch, so don’t destroy it. This recipe allows you to swap all affixes between two different costumes – useful for when you buy a new costume and want to swap all your affixes and core onto that costume. This recipe replaces the Transfer Costume Affixes recipe, and upgrades the old recipe, which transferred affixes from 1 costume to a new costume. This recipe also swaps the cores and visual affixes. Design Note: Our old recipe transferred affixes and caused players to accidentally delete affixes if they didn’t execute it properly. We’ve replaced the recipe to ensure people don’t accidentally nerf themselves. Crafting the Bovine Sector recipe now takes 1 hour instead of 10 hours. Design Note: We think the Bovine Sector (cow level) is fun and it’s on our list of high-priority items to work on. Since we fixed the bug that allowed multiple uses, we decided it would be more fun to reduce the crafting time to 1 hour. This is a very small first step in a plan to make your battle against the Skrull-Cows as fun, challenging and rewarding as possible. Ultimate pack exclusive costumes can no longer be destroyed by dropping them. Design Note: We did a pass on all items and artifacts to ensure maximum fun. We found about 70 items that were below our power curve, so we buffed all of them and will roll them out over the next two patches. We found 1 item that that was dramatically above our power curve, so we reduced its power level. We want players to have a lot of different options with items, and to select items based on their play style and build. If someone enjoys pets, there should be viable items to support that build. If people prefer a dodge build, crit build or AoE build then there should be options to support that style build. You’ll notice that we focused on buffs rather than nerfs, which is what we strongly prefer. We don’t like reducing an item’s power as a general rule because we know that players spend time farming and trading for specific items. Our one nerf was Edge of Infinity because it was dealing the highest damage, by far, of any item in the game. It wasn’t even close. In this case we decided to reduce only the base damage, but leave it as the strongest pure damage item for many builds, particularly crit focused builds. Once these changes are live, we will be monitoring performance and player feedback. We will continue to adjust them to give players the freedom to choose the artifact that fits their play style best. Their Medallion now increase Max Damage Reduction. Increased the chance for Medallion’s fear effect slightly. Increased the Power Radius bonus from his Chapter 8 medal slightly. His medal and medallion now list the damage dealt by the chance-on-hit effect. The damage for his medal and medallion’s chance-on-hit effect has been greatly increased. Her medal and medallion’s bleed damage has been doubled. His medal and medallion’s damage has been greatly increased. His medal and medallion now lists the damage dealt by the chance-on-hit effect. His medallion will now grant approximately double the spirit it was granting previously. His medal and medallions chance-on-hit damage for all effects. His medal and medallion now have a range for its fireball effect. His medal and medallion’s fireball effect have had their damage increased. His medal and medallion now have a range for its effect. His medal and medallion’s chance-on-hit effect has had its damage greatly increased. His medal and medallion now lists the damage dealt by its “flames” effect. His medal and medallion have had its “flames” effect damage increased. His medal and medallion’s effect has had its damage increased. The Edge of Infinity artifact has had its bonus damage reduced by approximately 30%. Crit chance and bonus damage on crit remain the same. Darkhold Scroll and Phoenix Feather artifacts now display cooldown in the tooltip. Players can now only enter the Bovine Sector once per consumable item, and the portal will go away when the player leaves the Bovine Sector. Note: We have also reduced the crafting time to 1 hour, down from 10 hours as described in crafting changes. The Max Defense Reduction stat is now properly displayed on the character sheet. The tooltip for Bonus XP on the Character Sheet stats tab has been corrected. Fixed an issue where the ‘Freezing’ affix effect would activate inappropriately or too early for many boss powers. Fixed Rhino, Lady Deathstrike, Kingpin, and Juggernaut not receiving charm resistance while charging. Magneto will once again chase his target during Metal Storm. Ice Ring will no longer immobilize targets (unless they remain in the AOE long enough to be stunned). Fixed an issue where Wizard’s Triple Disc throw had all three discs on top of each other instead of spread out at 30 degree angles. Various tooltip text fixes on hero powers. Searing Shot: Fixed an issue where visual effects when hitting enemies were not seen. Aggressive Shout: Fixed an issue where the power had both a 10 second buff and an ongoing (lasts until turned off) buff, and only one of them was being shown. Radar Sense now properly dodges incoming skillshots, and displays the correct chance on its tooltip. Synergies for Channeled Repulsors have been fixed and are working as described. Re-enabled animations for the /wave and /showoff emotes for Spider-Man’s Symbiote costume. Creatures summoned by artifacts and medals, such as a Moloid Leaper and Sinister Clones, are now summoned at the level of the item instead of at level 1. This will make them much more dangerous, as they should be. Design Note: We want creatures summoned by items or powers to be strong and effective. If players want to use a “pet” based strategy, we will keep balancing to ensure it’s viable. Pets are no longer targeted by bouncing attacks. Fixed an issue where the medal would grant invulnerability to nearby orbs as well as players. Fixed an issue stopping hero movement when its fear effect activates. Moloid Leapers summoned by the medal now attack enemies more frequently. Fixed an issue where sound could be lost intermittently after changing locations. When buying Gs, the United States state selection list can now be scrolled past ‘Tennessee’ as intended. G purchases should now correctly display in supported local currencies at checkout. For the list of our current known major issues, please check this post in our forums as it will be updated regularly.